Enjoy beautiful mountain views in your luxury one, two or three bedroom apartment home or townhome at Camden Vineyards in Murrieta, just outside of Temecula. Within the open-concept floor plan of each apartment home, our residents enjoy kitchens with plenty of cabinet and counter space, stainless steel appliances and full-size washers and dryers. Homes also feature living rooms bathed in natural sunlight, large walk-in closets and private patios. And, the neutral color scheme throughout makes it the perfect blank canvas to create the lifestyle you’ve been dreaming of. As an added bonus, choose one of our townhome floor plans to enjoy the luxury of an attached garage with plenty of space for your car (or two!) as well as additional storage space. 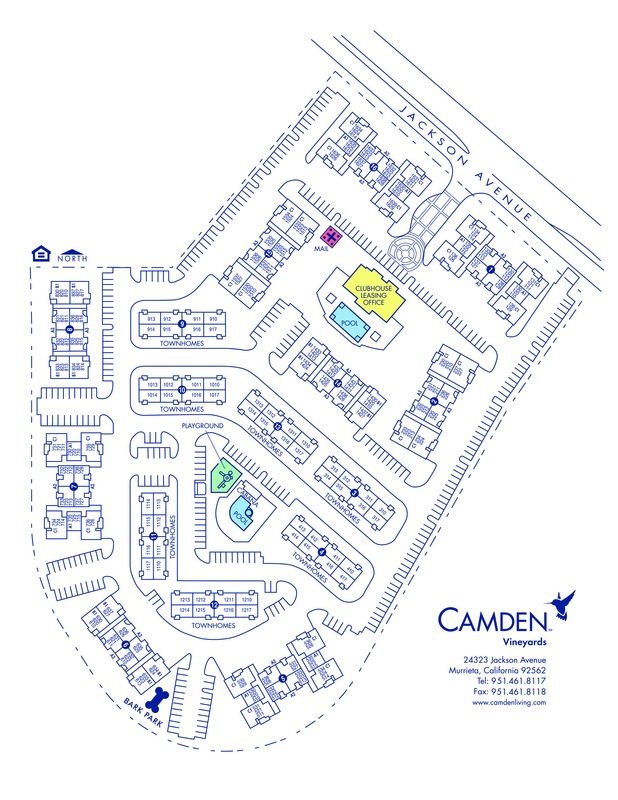 At Camden Vineyards, life gets easier with our resort-style amenities just steps away from your front door. You have the chance to go for a swim in the large swimming pool, soak in the hot tub, entertain poolside at our outdoor BBQ grills and enjoy beautifully manicured walking trails around the community. You can finally drop that costly gym membership by visiting our 24-hour high endurance fitness center with cardio equipment and more. We want your pets to love where they live too! Our pet-friendly community includes a fenced-in, private dog park and several pet stations throughout the entire community. Additional Camden Vineyards perks include an outdoor playground, Wi-Fi in common areas and parking for your visitors. Just outside of the sprawling vineyards in Temecula, Camden Vineyards apartments are close to plenty of shopping and entertainment. With Promenade Temecula just a few minutes away, you don’t have to go far to enjoy a day of shopping and dining. Camden Vineyards is also only a few blocks from Reading Cinemas, where you can catch a movie and unwind after a long week. Living across the street from the California Oaks Sports Park will also come in handy when you are looking for something to do on the weekend. Residents receive a technology package included in the total monthly rent with a savings of up to 54% off retail. This money-saving package includes high-speed internet up to 300 Mbps and 225+ channels including over 120 HD channels and HBO. Looking for more options? Access Time Warner Cable TV and HBO Go from your smart device + over 250,000 Time Warner Cable WiFi hotspots nationwide. The good life in a Murrieta apartment or townhome is waiting for you. Come home to Camden Vineyards. Breed Restrictions: American Pit Bull Terrier, American Staffordshire Terrier, Staffordshire Bull Terrier, any mix of the previous breeds, or any other dog or breed deemed aggressive. Please see management for pet approval.